Bibliotekscaféet offers a complete café selection of homemade cinnamon rolls, cakes, tasy and fresh sandwiches in different price ranges in the middle of Chalmers library. Our friendly staff serve freshly made coffee from newly roasted and ground coffee beans. 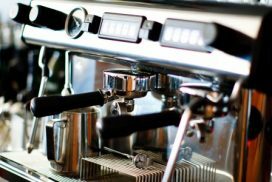 We also serve espresso, cappuccino, café latte and a variety of tea.